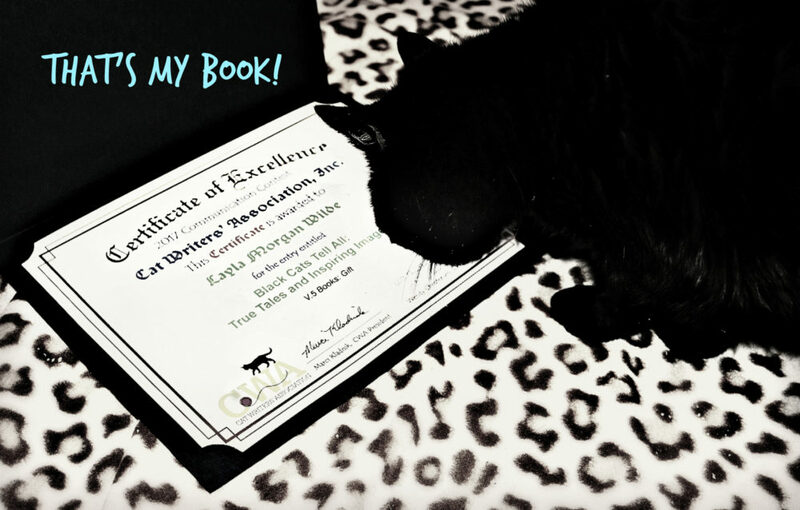 Black Cats Tell All Book Awarded Certificate of Excellence by feline editor Clyde and other Monday Mews. What’s this? Sniff sniff. Fancy paper for me from the Cat Writers’ Association? Who knew such an organization existed, but it does and there are many best-selling and notable members.My mom and fellow writer/editor has been a member since 2011 and has won numerous certificates of excellence and their top prize, the Muse Medallion, three times. I might only be a cat but but why isn’t my name on it? It’s a victory for panther power. Layla wrote an amusing post for Cole And Marmalade about black cats and it’s been already shared over 5000 times. Go Panfurs! 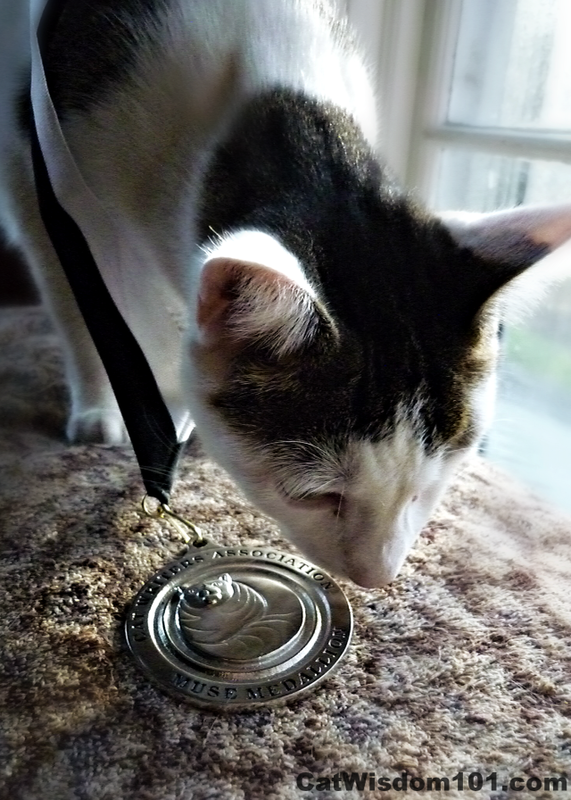 My furbro, Odin meowdeling one of our past Muse awards. He’s not black but we are colorblind around here. We also don’t need awards since we live for instant gratification in the now. Hello, catnip, my reward. It tastes so much better than paper. I’m proud to be a part of this labor of love to benefit black cats. It’s ironic that my story in our nonprofit book is called, “The Catnip Made Me Do It” since I wasn’t really into catnip then. 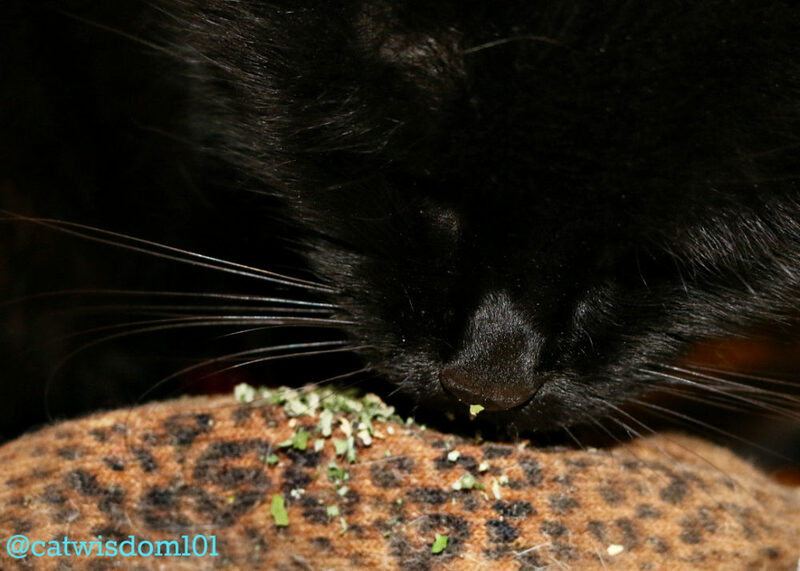 You might say, I’m a late adopter, having acquired a taste for catnip as an old man of 17! I must also acknowledge my fur angel in crime, the late, great Merlin. He was and continues to be our Muse-in-residence. Layla has known many cats in her life but Merlin was her everything for twenty-one years. Black Cats Tell All: True Tales And Inspiring Images is dedicated to Merlin. After our dear Gris Gris died in 2014, a beautiful burial mound in our garden was created. Odin and Domino but especially Merlin, adored Gris Gris and would visit. The plan was to expand the mound but the root ball of the tree flattened and other locations were considered. As it turned out, the very spot Merlin in buried is under his name in this photo taken two years before he died. Last week, I shared the horrible state of his grave. It did not winter well. The angel cat sculpture was missing an ear and a part of a wing. Broken ceramics, empty votives, cracked terracotta and dried debris littered the mossy memorial mound and graves of all our cats. A spring cleaning was needed and to honor Merlin’s death anniversary on May 11, I will post weekly updates of the changes. Yesterday, a nasty storm blew in and this was as far as we got in phase one of the clean up. Mother Nature will pitch in soon I hope. Everything is in a continual cycle of transition and there is beauty in every season. Make your days and dashes count. Should you feel like purchasing our book in memory a beloved cat, please order directly and message Layla with their name. 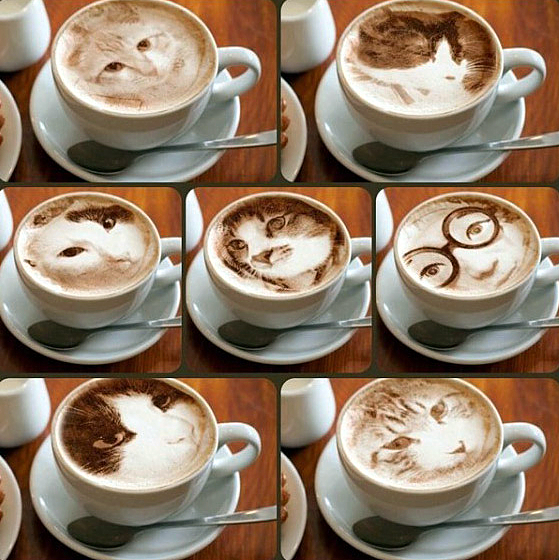 If it’s Monday, it must mean coffee for many folks. Clyde and the rest of the gang. We love you, no matter what color your fur is. Are you following all our furry news and fun on Instagram or Pinterest? There is always something new and not seen here. 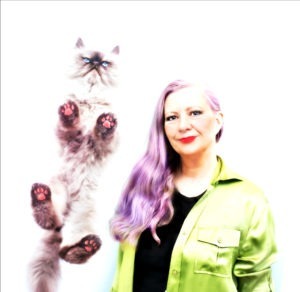 We are @catwisdom101 across all social including Facebook and Twitter and my personal favorite place @blackcatsofIG where there is a cat art feature every Monday, featured cat videos, adorable adoptables and daily shout outs in our stories. Certificate of Excellence? Now that is a great thing! I am sur Merlin understands and will wait patiently until everything is straightened out. He was after all very laid back. 🎉🎉🎉🎉🍾🍾🍾🍾🌹🌹🌹🌹😻😻😻😻 Congratulations! We’re so happy we could be a part of it! Thank you so much! You didn’t get my message about it? Congrats and concats on that wonderful honor for your book! I have a shambles of an outdoor kitty memorial area too…I need to get at it and clean it up. I do bring my concrete kitty angels and other items inside before frost comes, because they don’t weather the weather too well. My first 4 kitty graves do not have proper markers, just painted pavers…so really I need to do something about that too. Since none of them are buried in that little garden, they are way in the back, where now a shed stands in front of them…Minko is inside the house. I cannot bring myself to bury his box. Thanks so much! And I usually bring in terracotta planters and didn’t this year and they all cracked. I look forward to seeing your freshened up memorial garden. Congratulations on your well-deserved certificate of excellence for a meowvellous book of which you should be proud. I’m sure that book’s message is making a difference in the lives of our lovely house panthers. Hope your angel cats’ resting place will be restored to its former hallowed glory. Congratulations on your Certificate of Excellence! Ernie is so proud to be a part of it. I showed this to Ched, who then purred and mewed his response in Cat Code.. Translation: Love love love …hearts hearts hearts…love love love …hearts hearts hearts. Ched is so grateful that you’re doing all of this…for black cats, for all panfurs…everywhere. What terrific news…yay! I’ve avoided making an exterior memorial, just because I figure that we will move someday and want ‘everyone’ to come along. Congratulations on your Certificate of Excellence! It is WELL deserved! Thank kindly dear Summer and mum. Concats to you!!!! We all knew the book would be great no matter what! I have to get busy on my memorial garden area. The resting places cover about 1/3 of my yard now. I am not so sure that Srring will ever actually get here or if we will continue to yo yo up and down all year long. My best friend’s 14 yr old black cat ISIS crossed the rainbow bridge on Thursday 4/12/18. Luvs to all past present and future each one is singular priceless jewel. Old Man Winter has been cruel thats for sure. You will get everything in order soon. By May 11, I am hoping we see the last of the nasty weather. 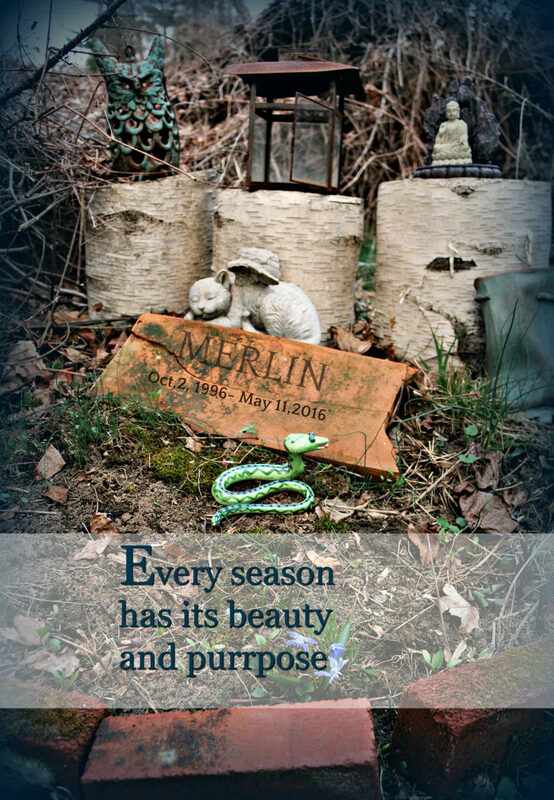 Merlin’s site will be beautiful again, spring is a time of renewal. His memorial may be a bit discombobulated but his memory lives on in your heart. Huge concatulations to you on this well deserved honor!! That is sad that all of your memorials were messed with by Mother Nature. I am sure you will give them loving care that will make them even more beautiful than before! Your garden will be beautiful again. Congratulations on a well earned award! It’s a great book and one that I think brings so much to our community and the wider world. Ah yes the winter has not been kind to all gardens, but spring is the season of renewal and so I am sure Merlins memory, though not dimmed will shine ever radiantly come summer.